Make your case with confidence with Sharpie® Flip Chart™. The uniquely formulated, water-based ink will not bleed through paper, and the non-squeak, bullet tip is designed to deliver a superior marking performance. The low odor formula is perfect for office or classroom settings. 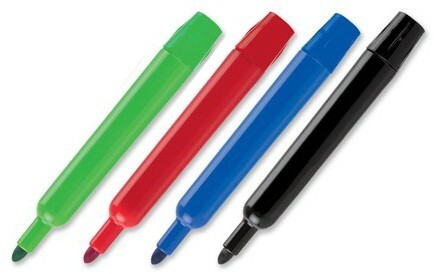 Bright, vivid colors are an instant standout on flipchart paper or presentation boards. Seven distinctive colors make a brilliant statement. · Water-based ink formula will not bleed through flip chart paper or presentation boards. · AP Certified, non-toxic ink. The most premium pen from Sharpie® – a stainless steel, refillable pen that delivers the same bold, smooth, high-quality writing experience of the Sharpie marker with a pen that doesn’t bleed through paper. · Refillable. Let yourself get permanently attached! Take note of the Sharpie Pen for everyday writing! It makes a bold mark that you expect from a Sharpie but doesn't bleed through paper*! Available in black or blue ink that is acid-free, fade-, water- and smear resistant when dry as well as AP certified non-toxic. The unique extruded plastic tip allows for durability and line-width consistency so you can write with ease and confidence. Be the first to try Sharpie's first pen! *Results may vary based on paper characteristics. 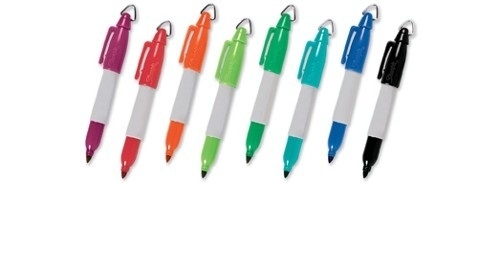 Marking has never been this easy with the Sharpie Retractable Fine Point Permanent Marker. No more caps to lose, just quick-drying, bright colored inks with imprint-friendly barrels and trims to match the ink color at the click of a button. 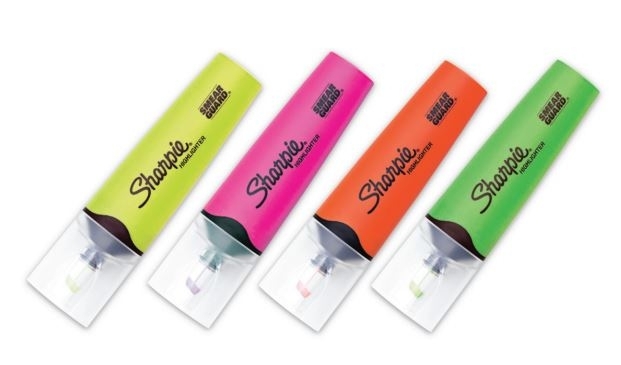 To keep you worry free, the Sharpie RT uses a signature Safety Seal feature to prevent drying out and allow you convenience. Next time you need to CLICK & GO, pick up a Sharpie RT. Retractable for one-handed ease of use. Fine point, permanent marker color (in 2 vivid ink colors) matches trim. Safety Seal valve design prevents dry-out. Quick-drying, AP certified non-toxic ink. Sharpie RT can be customized with a multi-color imprint.